While perusing Instagram the other day, I noticed some extremely harsh comments being tossed around on a post featuring the Man Repeller in a pair of high waisted jeans that looked like they had been plucked straight out of a Calvin Klein ad from the nineties. And because I was in the middle of editing this particular post featuring a similar style, I was anxious to see what kind of response the ensemble was generating on the social media platform. Now, although the post had quite a few likes, there was also a handful of hateful comments carefully placed underneath it as well. Some followers shouted “mom jeans”, while others claimed the look she was donning was “not real fashion”. So, after reading the onslaught of insults being hurled at Leandra, I felt a strange obligation to defend the look. However my style mavens, what moved me to step in and post a comment praising the ensemble was not based on the fact that I too have been proudly sporting a pair of my very own mom jeans, but instead stemmed more from a personal need to defend an artist, or in this case blogger’s, freedom of creative expression. I think I’ve made it very clear in many of my previous posts that being brave enough to wear something that rocks the boat a bit, and doesn’t simply look like a slightly altered version of what every other blogger is wearing, is something that should be celebrated instead of insulted. How is it that in this day and age, we still see people being persecuted for simply being different? And I am not just talking about fashion choices at this point, I am speaking in general terms. I mean, isn’t it our differences that keep us moving forward and make us want to strive for something more than what is simply already sitting in front of us? If it wasn’t for the movers and shakers like the Man Repeller, we would all be standing still in a pool of mediocrity. 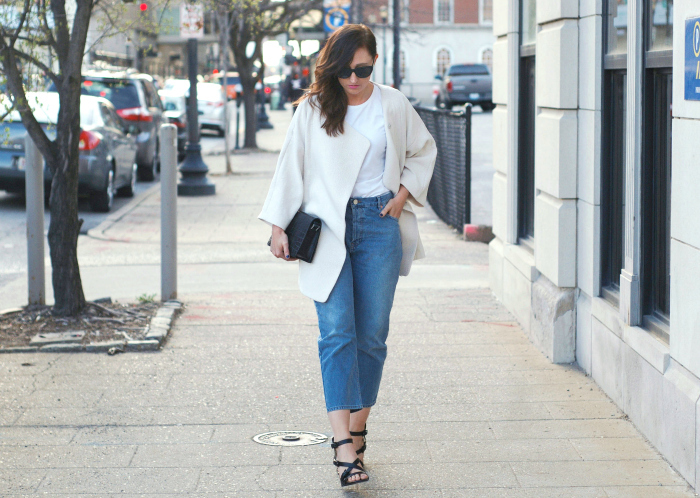 So naysayers and fashion enthusiasts who simply celebrate the norm be damned, because I am proud to be rocking my mom jeans, and most importantly, to be having fun with fashion! Love the denim teamed with the cream jacket Miranda & totally agree with you that fashion should be fun & you should wear what makes you feel good. Couldn’t agree more! I’d much rather wear what I want and not be as popular than to wear a suit and tie like everyone else so that I “fit in”. Keep doing you, boo. You look great! Love this look 🙂 That white jacket is gorg. Love your look with them! I think it is all about the styling. I do however think that heels do look best with oversized silhouettes in general! Amen! And I love them on you! Such a fabolous denim + tee combo! You look very powerful, dear! Love your hair and the shape of your coat – a very individual outfit!! Stunning, Miranda! PS: Didn’t even know about Leandra! She rocks!!! She rocks, for sure! So glad I into’d you to her!! Love your look Miranda! Who would have thought what we always wore would make such an impact. I took out my jeans from the 1990s and enjoy the fact my b.. doesn’t show when I bend. I completely agree with you! And I really don’t like it when people post mean comments, on ANY blog. It’s just so unnecessary. You look incredible! 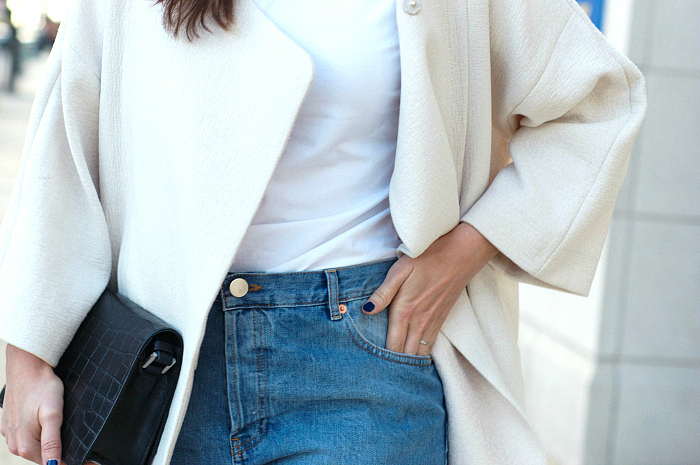 I LOVE that cream coat, and the jeans are perfection. I LOVE THIS STYLE SOOO MUCH! TKS FOR SHARING. BTW, GREAT PICTURES. Love to visit this amazing blog, thank you for sharing!! !